When you found out you were pregnant, you undoubtedly understood that your finances were about to take a big hit. You probably planned for a maternity-reduced income. You might have looked in to diaper prices. You made lists of baby's clothing, toy, and furniture needs for the first 12 months. Otherwise, you figured you were in the clear. Mommy's travel expenses have dropped, and no more corporate lunches, because you'll be at home. Problem is, being at home costs money. Eating at home for most meals means more groceries. Working away at chores like laundry during the day uses more water. More lights, more television, more heating and cooling is required than you would if you were at work. It all costs money. Sure, you'll be going to mommy groups, the mall and the park, but if you don't plan for the increased demand, you might be shocked when the first bill comes. We have delved in to all things energy efficiency; peak time pricing and quick home tweaks to save you money! Many states and provinces have implemented a tiered pricing system for billing on hydro and water usage. In Ontario, this so-called "peak time" pricing varies by 50% for on-peak versus off-peak pricing - a huge difference. What is considered "peak" depends on the time of year to a certain extent. As you can see, year round the cheapest time to do your chores is in the evening. If you can wait until after dinner to throw in that load of laundry or run that dishwasher, do so. If you need it done earlier, mid-peak is still far more cost effective than that premium priced time. The example offered on the Hydro One website demonstrates this saving; running the dishwasher costs approximately 18 cents in off-peak, 29 cents in mid-peak and 36 cents in on-peak time. If you run the dishwasher every day as I do, you could potentially save $5.40 a month just by setting it to run before bed instead of in the afternoon. Another comparison offered by Hydro One is that of hot water versus cold water laundry. Using off-peak time for both, you can save 34 cents a load by using cold water - 6 cents rather than 40 cents! Peak time is 77 cents for warm water wash! I have to say, I was extremely surprised at the difference. For my family of two adults and a baby, I run approximately 5 loads of laundry a week. This is a savings of $15.38 a month for my family or almost $200.00 a year. It's well worth putting an extra couple of dollars in to quality cold water laundry detergent in my opinion. These changes are conscious and my take a little time to get used to. While you learn to change your own chore behaviours, you can also make your home run smarter on its own. The two highest drainers of your home's energy are your thermostat and your electronics - even when they're off! Heating, and arguably air conditioning or cooling, are home essentials. If you have a baby at home, you can't push the limits too far in terms of survivalist techniques, but you can reign in your usage considerably. My rule of thumb is "dress yourself before you heat the furniture." You don't need your whole home at 25 C in March. Put on a sweater and spot heat the areas of your home you most use. Utilize the warmth of the sun by opening the curtains in the cooler months and avoiding the sun when it's warm. Use a programmable thermostat to lower the temperatures when you are in bed or out of the house. Check old windows and door jams for drafts. Minor repairs can mean major savings. You may have heard of something called "phantom load." This phenomenon is the draining of a small amount of energy that your electronics use when they are off. You can see this in those little lights indicating that your product is plugged in, even though they're not in use. Why does this even exist? In any case, it does, so here are some tips for minimizing their drain on your wallet. Plain and simple - unplug stuff. Your toaster doesn't need to be plugged in at all times. Your single serve coffee maker heats up in a jiffy. Don't waste your cash unnecessarily. For the things you use daily, such as your television and its accessories, consider a power bar with a shut off function. Plug your cable box, dvd player, sound system and television all in one place and flick them all off with one switch. You can go one step further and involve a timer so your equipment is turned off automatically. Fit your porch and safety lights with energy efficient light bulbs. 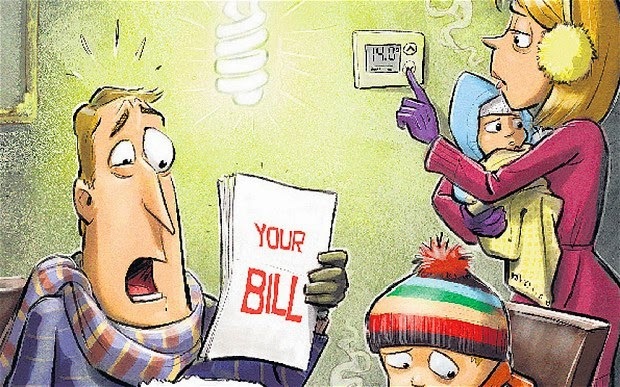 Not only will they save you money on your bill, but their lifespan will mean you're swapping them out far less frequently. Finally, we all know that the height of summer and the dead of winter are always expensive for families. As prepared as you are, budget for this expected bump so that you are not left in a pinch. We would love to hear your ideas for saving money at home! Join the conversation on Facebook by messaging us at www.facebook.com/WIYDB.